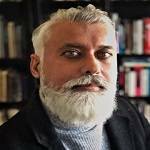 Harsha Ram is associate professor of Slavic and Comparative Literature at U.C. Berkeley. His first book, The Imperial Sublime (2003) addressed the relationship between poetic genre, aesthetic theory, territorial space and political power in eighteenth- and early nineteenth-century Russian literature. His forthcoming book, The Scale of Culture. City, Nation, Empire and the Russian-Georgian Encounter, seeks to provide a historical account of cultural relations between Georgian and Russian artists and writers during the imperial and early Soviet eras, while at the same time offering a site-specific case study of how a "peripheral" city on the margins of multiple regional systems negotiated the challenges of historical modernity and aesthetic modernism.